One of the best parts about being at a school like Wharton is having access to amazing, talented faculty members, who are doing incredibly cool, cutting-edge research. Getting to know, work with, and study under faculty members was one of my top priorities at Wharton. 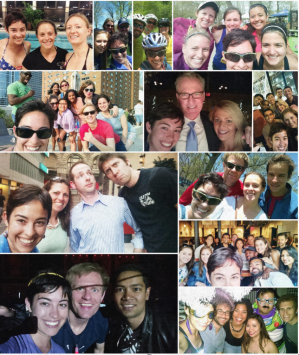 My time at Wharton is coming to a close — it’s passed so quickly! In reflecting on the last two years, I think back to 2013 — before we had even started at school. Joel Meek, WG’07, and one of my recommenders, shared with me a strategy he found successful during his time here: focus on doing three things well, because Wharton is overflowing with opportunities and it’s easy to want to do all of them. This ended up being excellent advice, and advice that I used to guide my time at this school. Being able to double-down on a few areas and give them complete attention made them that much more meaningful and worthwhile. On first arriving, it quickly became clear that Wharton’s reputation for quantitative excellence is well-deserved. At Google, where I worked before school, we focused on making good decisions backed up by data. Wharton provided a great opportunity to focus on flexing my analytical muscles. Pictured left: Nameplate decoration. Previous decorations include Elect Lori Donchak and People Analytics Conference stickers. Analyzed all sorts of count data, like student social media participation (Thanks, Prof Fader!). Spending the summer at McKinsey in New York also contributed to the growth of these skills … I made more than a few models on the fly! I’m looking forward to heading back to McKinsey after graduating and leveraging some of these tools there. 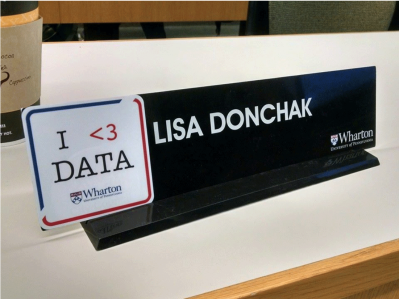 At Wharton, I declared a custom major in Behavioral Analytics and supported the student founder of the Wharton Data Visualization hackathon. I was also the student founder for the Wharton People Analytics Conference … more on this next. Behavioral economics and decision making have always been passions of mine, and taking Katy Milkman’s Managerial Decision Making course last year was an academic highlight. 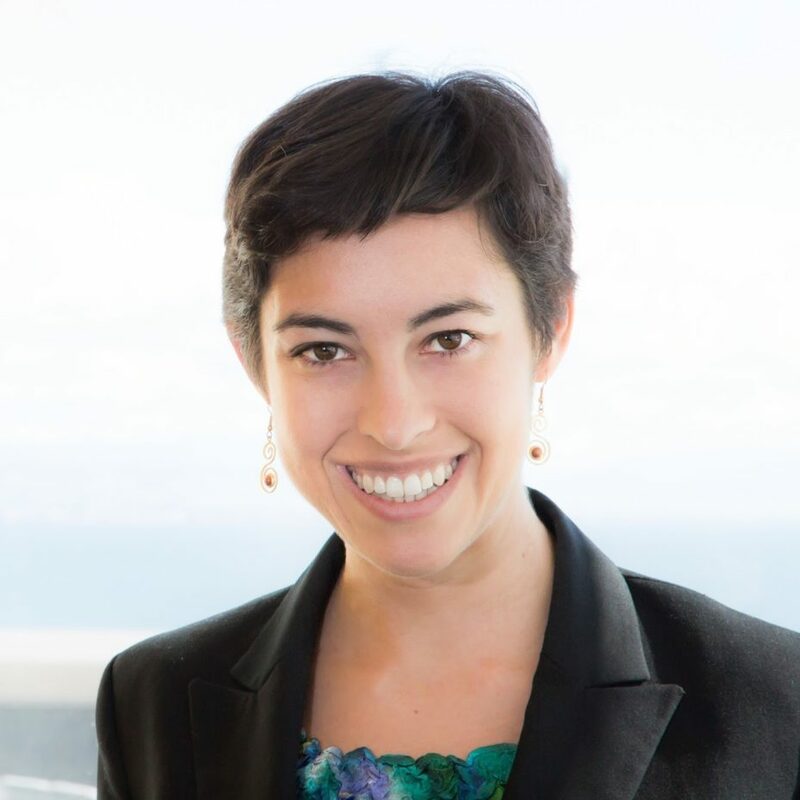 Not only that, but she and her team allowed me to work on a — wait for it— behavioral economics, exercised-based study with Google. Pretty much all of my favorite things in one bundle! Before school even started, a good friend introduced me to Adam Grant, who took a risk on me and suggested we launch a People Analytics Conference. He sent me over to Cade Massey, who I somehow convinced to meet with myself and a team of students on a weekly basis to launch this conference. Last year, we did. This year, we doubled in size and duration. Working with these two faculty members and the student team has been a transformational experience. There is literally no way I can thank them enough. The faculty members here are nothing short of incredible, and the amount of time and effort they put into their students is humbling. I’m honored to have worked with all of these amazing professors. A two-year MBA experience is nothing without a great student community. Our student colleagues here at Wharton are astounding. I’ve met a student who worked for the Thai government, a 2:16 marathon runner, a woman who served in the military as one of two women in her 40+ person unit, a Bangladeshi who got his license while here at school, and a JD-MBA who, on Everest a few weeks ago, abandoned his quest for the top to help those in Nepal. The students here are incredibly talented and diverse – it’s not just a marketing ploy! Some of our colleagues are also reaching personal milestones, so worthy of celebration. Some of us have fallen in love with classes, ideas, or people. Some have gotten engaged, or married, or had a baby— or two!— all while at school full-time. Sometimes we forget how special, and important, these moments are. Indeed, they’re the ones we’ll remember ten, twenty, or fifty years from now. In my personal life, I’m fortunate to have met another ultrarunner— Will, also graduating this Sunday— who I somehow convinced to move back to San Francisco with me. We’ve been dating since fall 2013, and spending time together is easy and fun, since he wants to run ludicrously long distances, just like me! Sometimes, when we talk about business school, we talk about the travel and the parties. Focusing on just those elements does a disservice to the experience; those activities are just a means to an end, and that end is finding the people who really matter, and supporting them no matter what. Ultimately, we Wharton students are a family. We hold each other up through the hard times— like when one of us doesn’t get that internship offer or is going through tough personal challenges. We celebrate with each other through the great times— like having a child or receiving the Palmer Scholar designation. We don’t always agree with our peers, but having the opportunity to learn from, and respect, those different backgrounds and opinions is what makes this place so special. We’re a family. We love each other no matter what. We’re stuck with each other, and that’s a great thing. In the last month here, I’ve been participating in the Group Selfie Challenge. The goal is to take a group selfie every day until graduation. It’s been a great way to document our last few weeks at this amazing place. Graduation is Sunday, May 17. Over the summer, I’ll be interning with the National Park Service in Washington D.C. In September, I’m starting full-time at McKinsey’s Silicon Valley office in Palo Alto, which I’m extremely excited about. Wharton has been a phenomenal experience, and I can’t wait to be officially part of the alumni community.